Advil Liqui-Gels Minis are perfect for those looking for an easy-to-swallow liquid-filled capsule that provides powerful pain relief. Powered by the same proven active ingredient as Advil Liqui-Gels, Advil Liqui-Gels Minis are 33% smaller, making them easier to swallow without compromising their effectiveness. Whether you suffer from headaches, back pain, muscle aches, menstrual cramps, minor arthritis, and pains associated with the common cold Advil Liqui-Gels Minis delivers fast, powerful pain relief for your tough pain in an easier to swallow size. If you’re looking for fast acting pain relief, in an easy to swallow size, add Advil Liqui-Gels Minis to your Amazon shopping cart today. The medicine in Advil is the number one doctor-recommended treatment for effective pain relief and the #1-selling pain reliever among over-the-counter medications. Whether you have muscle aches, headaches, back pain, or a fever, the smaller, easier-to-take Liqui-Gels Minis will deliver long-lasting pain relief. 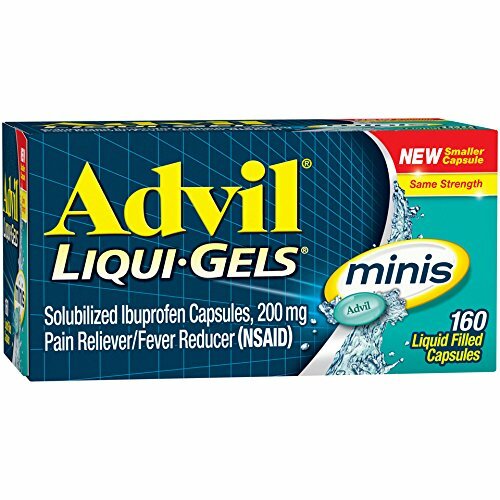 Get a head start on quick and effective pain relief by adding Advil Liqui-Gels Minis to your Amazon shopping cart. Dosing: For those 12 years of age and older, taking one liquid filled capsule every four to six hours is recommended while symptoms persist. If your pain or fever does not respond to one capsule, two may be used. Do not exceed six Advil Liqui-Gels Minis capsules in 24 hours unless directed to by a doctor. For dosage recommendations for those under 12, ask a doctor. Ingredients: The active ingredient in Advil Liqui-Gels Minis include 200 milligrams of solubilized ibuprofen (an NSAID). The inactive Ingredients include FD&C green no. 3, gelatin, medium-chain triglycerides, pharmaceutical ink, polyethylene glycol, potassium hydroxide, purified water, and sorbitol sorbitan solution. This product is sold in 20 count, 80 count, or 160 count packaging. PAIN RELIEF: Advil is the world’s #1 selling OTC pain reliever providing safe and effective pain relief for over 30 years.